Katie Powell graduated with a Master’s in Occupational Therapy from Saint Louis University in 2013 and is currently an occupational therapist in spinal cord injury at the Clement J. Zablocki VA Medical Center in Milwaukee, WI. 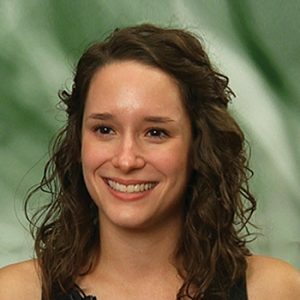 She served as the co-chair for the Early Career and Trainee Support Committee for the Academy of Spinal Cord Injury Professionals from 2013-2016 and will be a member of the Therapy Leadership Council Board starting September 2016. 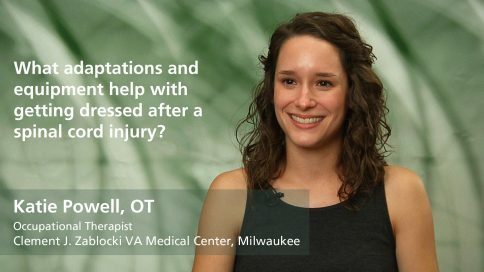 She has practiced in Spinal Cord Injury since 2015, but has always had a passion for serving this population, as her sister has a spinal cord injury. Powell has presented at national conferences regarding the development of early career practitioners, traveling with a spinal cord injury, and community accessibility, and is also the co-author of a chapter on social participation for individuals with disabilities. How soon after a spinal cord injury should occupational therapy begin? How does someone with a spinal cord injury cope with the changes to their bladder and bowel? How should a home be organized for safety and accessibility for a new wheelchair user who has a spinal cord injury? What adaptations and equipment help with cooking after a spinal cord injury? How do adaptations and equipment help with bathing after a spinal cord injury? What adaptations and equipment can help with personal hygiene and grooming after a spinal cord injury? What adaptations and equipment help with getting dressed after a spinal cord injury? What adaptations can help someone with a spinal cord injury use a computer and phone? How does “voice activation” technology help someone with a spinal cord injury control their environment? What kinds of adaptations are available to help someone resume driving a spinal cord injury?